VIEW_SPW - shows experimental spectra (binary or ASCII formats) and carry out preliminary treatment of them: zoom, comparing, filtering, smoothing, Fourier transformation, peak-peaking, estimation of effective g-factor value, width and intensity of any line. FIELDS - calculates resonance magnetic fields and intensities of EPR lines and their angular dependencies for the rotation of magnetic field in arbitrary plane or road map. Special search algorithm is used to obtain resonance magnetic fields with desirable accuracy in reasonable time. The programs permit simultaneously to carry out the calculations for all equivalent centers: their magnetic coordinate axes are related to the initial coordinate system by sets of Euler angles, as well as reflections in mirror planes. ENERGY - this part of the Fields.exe calculates dependencies of energy levels on magnetic field, as well as dependencies of spectrum shape on azimutal and polar angles, line width, microwave frequency and any parameter of Spin-Hamiltonian. PARAMS - obtains parameters of Spin-Hamiltonian by fitting of calculated and experimental angular dependencies of EPR spectra. FAIW- visualisates experimental or calculated angular dependencies of resonance magnetic fields and convert into special symbols the information about line intensity and width. It permits also to extract the points, what you need, from array of experimental data and to prepare the data for fitting with the help of Params.exe. COSEUL - calculates main values of symmetric second rank tensors, the cosinuses of main axes and Euler angles of main coordinate system with respect to initial one. HELP - there is a general tutorial "Visual EPR. Basics", as well as separate tutorials for every program. Fields.exe (Energy) and Params.exe programs operate with general Spin-Hamiltonian (this possibility is based on our "know how" - a gauge of Spin-Hamiltonian, see Refs. 1 and 2). 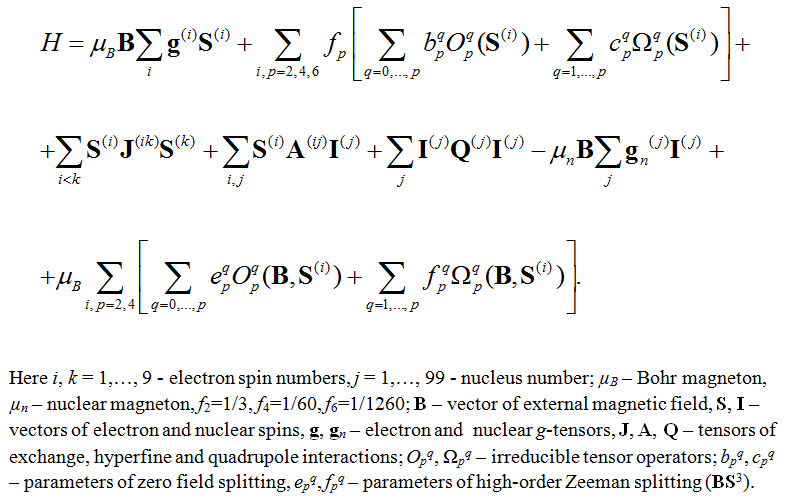 One part of the spin-Hamiltonian is treated using exact numerical diagonalization of its matrices.The number of particles (electrons and nuclei) in this part can be up to 9; total rank of Spin-Hamiltonian matrix have to be less than 128. Point group symmetry, the number of parameters in the Spin-Hamiltonian and values of these parameters are not restricted. The second part of the spin-Hamiltonian includes comparatively small hyperfine and quadrupole interactions of electrons with nuclei (up to 99 nuclei).This part is treated as perturbation. View_spw.exe is the basic program, which you can use immediately after measurements for the spectrum treatment. It prepares spectra and files with four-dimensional tables for other programs. View_spw.exe can be used for preparation of spectral files for Fields.exe (filtering, baseline correction, and algebraic procedures). View_spw.exe must be used to prepare angular dependencies of experimental spectra for comparison with calculated dependencies with the help of Fields.exe and for refinement of obtained spin-Hamiltonian parameters by fitting with Params.exe. FAIW.exe can be used for editing experimental angular dependencies obtained with the help of View_spc.exe. Fields.exe must be used to prepare calculated angular dependencies for comparison with experimental ones. Params.exe can be used for refinement of obtained spin-Hamiltonian parameters by fitting experimental angular dependencies. It uses angular dependencies edited with the help of FAIW.exe. V.G.Grachev. Correct expression for generalized spin-Hamiltonian of non-cubic paramagnetic center.- Sov. Phys.- JETP, 1987, v. 92, No 5, 1834-1844. V.G. Grachev. G-symmetry and theory of ENDOR frequencies for centers with low-symmetry interactions.- In: Radiospectroscopy of Solid State, Kiev: Naukova Dumka, 1993, p. 16-66 (in Russian). Copyright � SimuMag. All rights reserved.